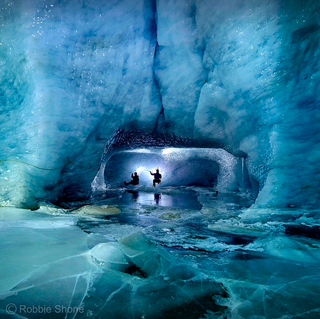 National Geographic shares this really cool photograph taken by Robbie Shone showing the inside of a glacier. Being inside the ice cave is like being in a sparkly gem stone or something. NatGeo says the explorers in the photo were installing a rope traverse below the surface of Europe’s second largest glacial system, the Gorner glacier. You can see more of Shone’s stunning photography from this exploration here.